Von Hippel-Lindau (VHL) disease is an autosomal dominantly inherited multisystem cancer syndrome with a predilection for the central nervous system (CNS) and the retina. Retinal capillary “Vvon Hippel” hemangioma is one of the most common and often the earliest manifestations of VHL disease and, therefore, ophthalmologists are frequently involved in the care of patients with this disease. The incidence of VHL disease is approximately one in 40,000 live births and it is estimated that there are approximately 7,000 patients with VHL disease in the United States. The main ophthalmic finding in VHL is retinal capillary hemangioma, which is a benign hamartoma. The anterior segment can be secondarily involved due to complications such as neovascular glaucoma and cataract formation. A large cohort study found only 2% of eyes had neovascularization of the iris. If a patient has a solitary retinal capillary hemangioma, they do not necessarily have VHL disease. However, they should undergo genetic testing. Retinal capillary hemangiomas are usually orange red, circumscribed, round, vascular tumors supplied by a pair of dilated and tortuous feeder vessels. They are most commonly located in the temporal peripheral retina. Juxtapapillary retinal capillary hemangiomas are less common, representing about 11% to 15% of cases, and their appearance can vary depending on whether the lesion is endophytic (grow from the retina into the vitreous gel of the eye), exophytic (grow beneath the retina), or sessile (flat). Retinal capillary hemangioma usually manifests as a solitary tumor, but approximately one-third of patients have multiple retinal hemangiomas, and up to half of patients have bilateral involvement. Secondary effects (from the retinal angioma) leading to visual loss, such as intraretinal and subretinal exudation, are often limited to the vicinity of the hemangioma but can be remote, often producing a macular star of exudates. Glial proliferation can lead to tractional retinal detachment and macular pucker. Retinal or vitreal hemorrhages are rarely observed, occurring in fewer than 3% of cases. reported to vary from 49% to 85%. The mean age at diagnosis of retinal capillary hemangioma in VHL disease is approximately 25 years, and most patients present between the ages of 10 and 40 years. The probability of developing a retinal capillary hemangiomas increases progressively with age. Recent publications indicate that the hemangioma is usually manifested by age 30, and the prevalence rate is stable thereafter. Therefore adults with a normal retina at age 30 years may have a low risk of developing a retinal capillary hemangioma during the reminder of their lives. The natural course of retinal capillary hemangiomas is variable (progression, stability or spontaneous regression). Small lesions may remain stable for years or may show evidence of gliosis without leakage, but some have been documented to enlarge. Most hemangiomas, however, tend to enlarge progressively and lead to retinal changes. In late stages they may cause massive exudation and retinal detachment, uveitis (inflammation), glaucoma and phthisis (shrinking of the eye). Classification systems to aid in staging the clinical progression have been developed. The fundus findings of retinal capillary hemangioma are usually typical, and diagnosis can be made based on ophthalmoscopic examination. The diagnosis might be confused with retinal macroaneurysm or adult Coats disease when severe exudation exists. The systemic manifestations of VHL are multiple and include CNS hemangiomas of the brain and spinal cord, renal cell carcinomas, renal cysts, pheochromocytomas, pancreatic cysts, islet cell tumors, epididymal cystadenomas, endolymphatic sac tumors of the inner ear, and adnexal papillary cystadenomas of the broad ligament. After retinal capillary hemangioma, the most frequently affected organ systems are the CNS, kidneys and adrenal glands, many of them occurring years after the initial presentation with retinal capillary hemangiomas. After diagnosis is made, screening protocols should be followed, including urinary catecholamines and ophthalmoscopy on an annual basis with MRI of the brain and spinal cord every 2 to 3 years, and yearly abdominal US with an additional abdominal CT scan every 2 to 3 years. VHL disease is an autosomal dominant disease whose gene is located on chromosome 3p 25-26. The gene functions as a tumor suppressor gene that promotes tumor formation when its function is lost. The normal protein product of the VHL gene forms a complex with other proteins that targets hypoxia inducible factors (HIFs) for degradation. Mutations in the VHL gene result in stabilization of the HIFs, which bind to specific enhancer elements in the VEGF gene and stimulate angiogenesis. With a near-complete penetrance of the disease and only rare instances of mosaicism, genetic testing has been proved helpful in early diagnosis and clinical screening for disease manifestations. VHL disease is an autosomal dominantly inherited multisystem cancer syndrome with a predilection for the central nervous system and the retina. Retinal capillary hemangioma is one of the most common and earliest manifestations of VHL disease. Fundus findings are usually typical, and diagnosis can be made based on ophthalmoscopic examination, but fluorescein angiography is an additional informative diagnostic tool. Various treatment modalities exist, although the mainstays of therapy are laser photocoagulation and cryotherapy. VHL disease, however, is associated with significant mortality secondary to either CNS hemangioma or renal cell carcinoma. Life expectancy of affected individuals can be improved by early detection, genetic testing and systemic treatment. Treatment of this syndrome requires cooperation of physicians from multiple specialists, including those to treat the central nervous system and kidney tumors. Annesly WJ, Leonard BC, Shields JA, Tasman WS. Fifteen year review of treated cases of retinal angiomatosis. Trans Am Acad Ophthalmol Otolaryngol. 1977;83:446-453. Choyke PL, Glenn GM, Walther et al. The natural history of renal lesions in von Hippel- Lindau disease: a serial CT study in 28 patients. Am J Roentgenol. 1992;159:1229-1234. Dahr SS, Cusick M, Roudriguez-Coleman H, et al. Intravitreal anti-vascular endothelial growth factor therapy with pegaptanib for advanced von Hippel-Lindau disease of the retina. Retina. 2007;27:150-158. Harris AL. von Hippel-Lindau syndrome. Target for anti-vascular endothelial growth factor (VEGF) receptor therapy. The Oncologist. 2000;5(suppl):32-36. Madhusudan S, Deplanque G, Braybrooke JP, et al. Antiangiogenic therapy for von Hippel-Lindau disease. JAMA. 2004;291:943-944. Magee MA, Kroll AJ, Lou PL, Ryan EA. Retinal capillary hemangiomas and von Hippel-Lindau disease. Semin Opthalmol. 2006;21:143-150. Maher ER, Yates JR, Harries, et al. Clinical features and natural history of von Hippel-Lindau disease. QJM. 1990;77:1151-1163. Maher ER, Lselius L, Yates JR, Et al. von Hippel-Lindau disease: a genetic study. J Med Genet. 1991;28:443-447. Shields CL, Shields JA, Barret J, et al. Vasoproliferative tumors of the ocular fundus. Classification and clinical manifestations in 103 patients. Arch Ophthalmol. 1995;113:615-623. Sigelman J. Retinal diseases. Pathogenesis, laser therapy and surgery. Boston:Little Brown and Company. 1984:316. Singh AD, Shields CL, Shields JA. von Hippel-Lindau disease. Surv Ophthalmol. 2001;46:117-142. Vail D. Angiomatosis retinae, eleven years after diathermy coagulation. Am J Ophthalmol. 1958;46:525-534. Webster AR, Maher ER, Moore AT. Clinical characteristics of ocular angiomatosis in von Hippel-Lindau disease and correlation with germline mutation. Arch Ophthalmol. 1999;117:371-378. Wong WT, Chew EY. Ocular von Hippel-Lindau disease: clinical update and emerging treatments. Curr Opin Ophthalmol. 2008;19:213-217. Wong WT, Liang KJ, Hammel K, Coleman HR, Chew EY. Intravitreal ranibizumab therapy for retinal capillary hemangioblastoma related to von Hippel-Lindau disease. Ophthalmology. 2008;115:1957-1964. Von Hippel angioma can grow within the retina or optic nerve. They characteristically have a “feeding” retinal arteriole and a “draining” retinal vein. Bilateral involvement can be seen in up to 50% of individuals. Von Hippel angioma are vascular tumors, not cancers and do not metastasize. Twenty percent of patients will be found to have the von Hippel Lindau Syndrome–associated with cerebellar hemangioma, pheochromocytomas, visceral cysts and renal cell carcinomas. Von Hippel angioma patients either have no symptoms, or become symptomatic due to secondary retinal detachment or rarely neovascular glaucoma. The symptoms of retinal detachment are flashes of light, spots in the vision (floaters), and loss of vision. The symptoms of neovascular glaucoma are eye pain, light sensitivity, vision loss, and headache. Some patients with von Hippel angioma will have a family history of this disease. Von Hippel angioma are usually visible by dilated eye examination (ophthalmoscopy). Ultrasound can be used to measure the tumor’s size, and to evaluate for high internal reflectivity. Ophthalmoscopy typically reveals a dilated feeder artery and draining vein. An associated retinal detachment may be seen around the tumor or may be so large as to cover (obscure) an underlying von Hippel angioma. Fluorescein Angiography – Note the feeder and draining vessels, as well as the bright “light-bulb” appearance. Von Hippel angiomas can appear in both an autosomal dominant hereditary or sporadic forms. All patients should be given periodic systemic examinations including imaging studies for cerebellar hemangiomas and renal cell carcinoma. Family members should be examined with indirect ophthalmoscopy. Genetic testing is available (see related links below). The treatment of retinal capillary hemangiomas can be a challenge to the ophthalmologist due to the presence of bilateral multiple tumors and the likelihood of new tumor formation. Despite treatment, up to 25% of cases can have permanent visual loss of acuity less to than 20/40 in one or both eyes. Various treatment modalities including observation, cryotherapy, plaque radiotherapy, and vitreoretinal surgery have been utilized. Recent advances in the understanding of VHL protein function and tumorigenesis have led to new treatments targeting the biology of the disease, as opposed to ablative or surgical approaches. Molecules upregulated or increased in the context of a VHL mutation, such as vascular endothelial growth factor (VEGF) and platelet-derived growth factor (PDGF), have been targeted in investigational anti-angiogenic therapies, both in systemic manifestations of the disease and in ocular disease. Observation is rarely employed due to the tendency of retinal capillary hemangiomas to progress. However, observation only might be chosen in small (Juxtapapillary hemangiomas (those next to the optic nerve disc) are particularly difficult to treat and are initially managed with observation because they can remain stable for years. As a general rule; since these tumors are not cancer and cannot metastasize; treatment should only be undertaken in case of tumor progression or a threat to visual acuity due to the adverse effect of treatment on the optic nerve and major blood vessels. Laser photocoagulation is currently used to treat small retinal capillary hemangiomas located in the retina in eyes with clear media. When possible, we first occlude the feeder artery, then (if necessary) to surround/demarcate the posterior 180 degrees of the tumor, lastly and again if needed directly treat the tumor’s surface. Patients should be informed that multiple laser treatment sessions are typically required. Potential complications include retinal detachment, retinal and vitreous hemorrhages. Typical indications for cryotherapy are anterior retinal location of the hemangioma and massive subretinal fluid, which can reduce the laser energy uptake. Double freeze-thaw technique is employed under indirect ophthalmoscopic observation. A 15-year review found that most all hemangiomas under 3.75 mm in diameter successfully responded to cryotherapy. Recent studies have indicated that anti-VEGF strategies may be effective. However, no large clinical trials have been reported. Adenocarcinomas and adenomas typically arise from a part of the retina called the retinal pigment epithelium or RPE. They can also occur in the ciliary body. Though all are rare, benign adenomas are much more common than RPE cancers. Less than 20 malignant adenocarcinomas of the RPE have ever been reported. Further, during the modern era of reporting, malignant adenocarcinomas of the RPE have never been reported to spread to other parts of the body. In the past, almost all RPE adenocarcinomas were clinically diagnosed as atypical choroidal melanomas and the eyes were enucleated. In Dr. Finger’s review of the literature, RPE adenocarcinomas were found to be more common in females, more likely to cause intraocular inflammation (atypical for choroidal melanomas) and have responded poorly to radiation therapy. Patients with adenomas of the retinal pigment epithelium typically have no symptoms. These tumors are found during routine eye examination and referred to eye tumor specialists for further evaluation. Ultrasound of an RPE adenocarcinoma reveals a “stuck on” the choroid appearance. Retinal adenoma and adenocarcinoma will appear black. They originate from the retina, so they are not likely to have a surrounding or overlying retinal detachment. Adenomas appear dark. “block fluorescence” on fluorescein angiography. Ultrasound may be helpful in distinguishing adenoma and adenocarcinoma of the RPE from uveal melanomas. Consider that they tend to arise from the retina above Bruch’s membrane. Therefore, they appear to be stuck on rather than growing from the underlying choroid. Several investigators have noted a tuberous rather than collar-button or dome-shape. Retinal adenoma should be photographed, measured by ultrasound and followed for evidence of growth prior to consideration of treatment. Histopathologic evaluation of the same tumor shows that it arises from the retina. In the rare instance of retinal adenocarcinoma, most patients have been enucleated with a presumed diagnosis of choroidal melanoma. Should adenocarcinoma of the retinal pigment epithelium be suspected, a biopsy should be considered. Characteristics of RPE adenocarcinoma are a female patient with a dark intraocular tumor and associated with iritis and/or uveitis. Note the flat, black well circumscribed lesion with areas of retinal pigment epithelial atrophy. The retinal pigment epithelium (RPE) is a pigmented layer of the retina which can be thicker than normal at birth (congenital) or may thicken later in life. Areas of retinal pigment epithelial (RPE) hypertrophy usually do not cause symptoms. 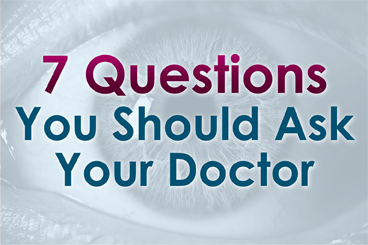 They are typically found during routine eye examinations. Congenital retinal pigment epithelial hypertrophy (CHRPE) is usually found before patients reach 30 years of age. They may enlarge with time, but are not malignant. CHPRE has been an association with Gardner’s Syndrome (familial colonic polyposis). Therefore, if your eye care specialist has told you that you have CHPRE( pronounced CHER PEE), it is reasonable to tell your primary care physician or gastroenterologist (if you have one) so that he or she may recommend the frequency of colon screening tests. This area of retinal pigment epithelial hypertrophy demonstrates a blue hue. tumors are more commonly found in the peripheral retina where thickness is more difficult to judge by ophthalmoscopy. Almost all patients with retinal pigment epithelial hypertrophy do not have symptoms. These pigmented intraocular lesions are found by eye care specialists during dilated examination of the inside of the eye (ophthalmoscopy). Eye tumor specialists can typically differentiate between retinal pigment epithelial hypertrophy and melanoma by clinical examination (without a biopsy). A small area of retinal pigment epithelial hypertrophy. It appears well circumscribed and with areas of relative lucency at the edges. 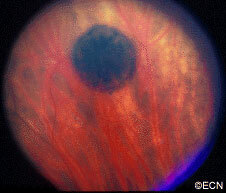 Retinal pigment epithelial hypertrophy (CHRPE and RPEH) can be diagnosed by ophthalmic examination. The eye examination will concentrate on the appearance of the retinal pigment epithelial hypertrophy. RPEH lesions tend to be black or atrophic. They may be surrounded by a halo of less pigmented tissue or exhibit a sharp demarcation line. Ultrasonography typically shows that RPE hypertrophy is flat to minimally elevated and slightly hyper-reflective. Fluorescein angiography of RPE hypertrophy typically demonstrates blockage of fluorescence (except in the areas of atrophy which are hyperfluorescent). Optical coherence tomography (OCT) of RPE hypertrophy will demonstrate both thickening and thinning. The overlying retina is thinned, the retinal pigment epithelium is both thickened or can be thinned. The underlying choroid is typically thinned. Photographic documentation of these lesions is recommended for future comparison. Ultrasonography and fluorescein angiography is typically used to differentiate RPE hypertrophy from uveal melanoma and certain rare intraocular tumors. Serial observation is warranted in that RPE hypertrophy can enlarge over time. The hypertrophic areas block fluorescence while the choroidal vessels can be visualized within the areas of atrophy. The hypertrophic retinal pigment epithelium continues to be hypofluorescent, while the choroidal vessels leak to form hyperfluorescent areas.